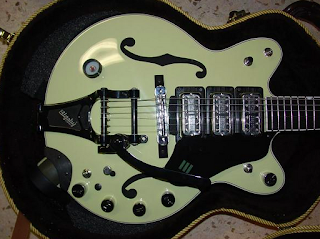 Jack White's "Green Machine" is a Gretsch "Triple Jet" hand built by Seattle based guitar craftsman Randy Parsons. It features a Bigsby vibrato, built-in bullet microphone and "secret electronics", and was used extensively in White's time with The Raconteurs. Parsons also built a copper "Triple Jet" for Jack, minus the microphone.